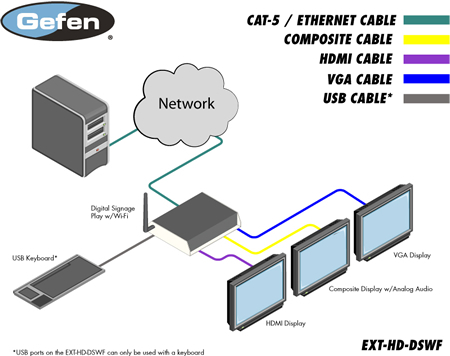 The Gefen EXT-HD-DSWF and SMIL-compliant Digital Signage Player is a LAN-based product, which supports 1080p Full HD, one-line scrolling text, 2-channel L/R audio, and calendar scheduling with over ten preloaded templates to choose from. The all-metal enclosure features a passive cooling system. The product comes with 4 GB of built-in flash memory and the securable compact flash card slot allows the addition of up to 16 GB of memory if needed (replacing the internal storage). 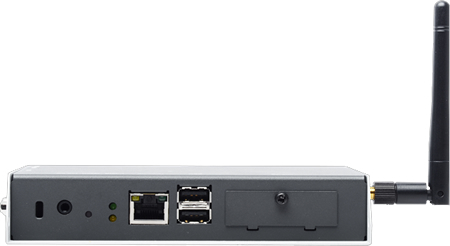 Two integrated USB 2.0 ports provide connection to a keyboard and USB storage devices. Support for over 20 different media formats provides a wide selection for content creation. A watchdog timer lets the product recover and resume playback after power and network disruptions. 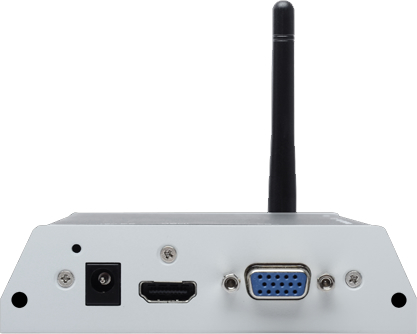 The Digital Signage Player with Wi-Fi connects to a display using analog (Composite / Component / VGA) or an HDMI cable. There are two options for connecting to the network: 1) Connect an Ethernet cable to the network, or 2) Connect using Wi-Fi. Then, connect a keyboard and peripherals to the USB ports to configure the unit. Use the included Composite A/V cables to connect the product to the 3.5 mm connector. Connect the 12 V DC power supply to the unit and connect the AC power cord to an available electrical outlet.